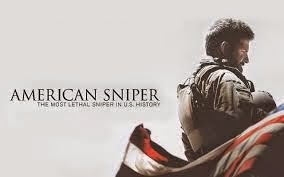 This past weekend I went and saw American Sniper WOW. It was a very powerful and moving movie, that made me cry in sadness for his wife's loss and for all of the soldiers over seas and here fighting for us right now. It really made me begin to realize all that all if those people are selflessly doing for others. Most movies have a boring part, but this movie just kept grabbing my attention! So, I recommend going to see it ASAP!